Lucy's Cards: Make a Wish..
Love them both Lucy...but the candle is so clever! Lucy, these are beautiful! Love the Kraft card, and the candle card is so clever! Very well done! Very nice cards, I like the idea. Thanks for the inspiration, Lucy! Another couple of simply stunning cards - love your work! Wonderful cards, Lucy! Love that candle--genius! Great use of the lace with the pearls ane the birthday card is FABULOUS!!! These are wonderful! 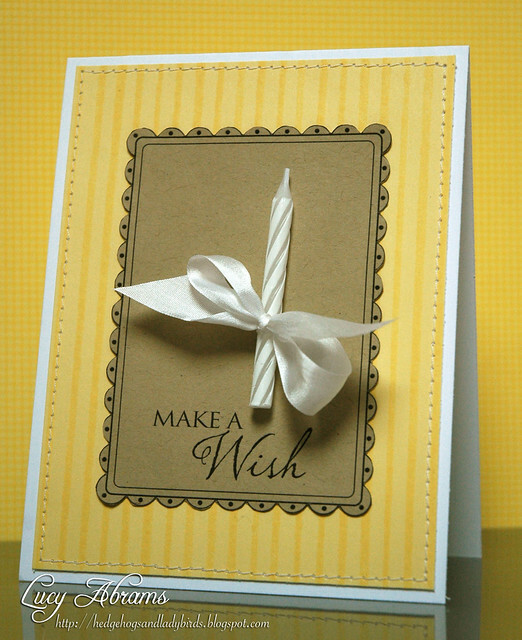 I never would have thought to put a real candle on a card, such a sweet idea. Goodness, that lace star is gorgeous, Lucy! And love the candle . . .such a fun idea! Two very marvelous cards, Lucy. The lace and candle are perfect and look incredible. love that candle card! may have to case that one! Love the lacy effect on the first card and that candle on the second. I need to find a cute candle - wonderful ideas and lovely cards. love the new digis released yesterday! thanks for the inspiration! Two fabuolous cards, that lace in the first is gorgeous, and I love the candle on the second card, such a fun addition! I love the lace with pearls, it's gorgeous. The candle is just too cute. What a great idea for a birthday card! I love your cards, Lucy! The stitching just adds so much to your cards. Thanks for the inspiration! These are BOTH stunning Lucy! It's not easy to make "simple" look this good, but somehow you always manage to do it. You amaze me! oooooh, I love the candle card! You're my idol! I LOVE both of these cards. The first one is Gorgeous! I love the candle on the second one ...very creative! Beautiful cards!! Love the softness in color and warmth on your first card! awwww.... HA's digi lace is gorgeous! such a pretty card, Lucy! and such a clever idea for the second card! love it! super cards, girl!